LEGO Santa’s sleigh arrives at Covent Garden, London in time for Christmas! Head on down and get your sleigh selfies! There’s still a few weeks to go before the big day but Santa has landed at Covent Garden! Well, OK, not the real Santa – here’s far too busy getting everything sorted for Christmas Day – so he sent a LEGO version instead! 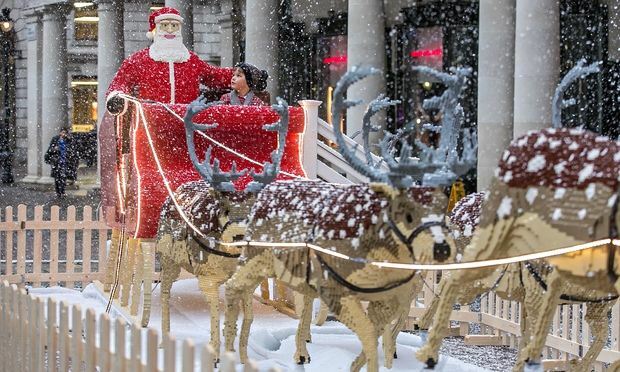 Santa gave the UK’s only LEGO Certified Professional, Duncan Titmarsh, the task of designing and building the model – including all nine reindeer – which takes pride of place at Covent Garden Piazza in London for the festive season! We’re well jel’ of Duncan’s job – he gets to play with LEGO for a living, how cool is that? It took him 700,000 bricks and 32 days to build this epic winter masterpiece! There’s an empty seat next to Santa so head down to Covent Garden to get your ‘sleigh selfie’ – and remember to share using the hashtag #LEGOSleigh! Post by Covent Garden London.